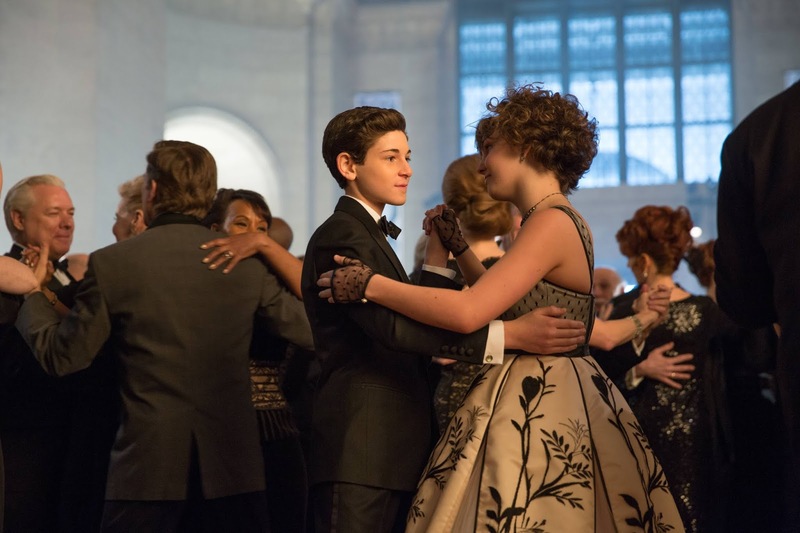 Bruce: "Selina, you look very nice!" Blimey, Barbara handles break-ups about as well as a high school sophomore who envisions himself in Three Days Grace music videos because his two-week old relationship came to a screeching halt. “No, stay back!” Barbara warns the deprived serial killer across from her, “When people see the real me, they run!” A fat lot of good it’s going to do you sweetheart when you keep taking shots at your self-esteem, thinking you’ll never be able to find someone as good as Jim Gordon. When I predicted last week that The Ogre was either going after Lee or Barbara by the time Season 1 wound down (with Barbara in fact being the one who grasps the short straw – hasn’t she suffered enough? ), I didn’t think it was going to be executed in quite such a fashion as ‘Under the Knife’ displayed. Does that mean it’s better than I thought? To be honest, I’m not sure yet how I feel about this new dynamic between Barbara and The Ogre. Honestly, I liked that at the beginning, Barbara isn't a complete sucker who quickly falls for The Ogre’s seduction tactics. But then as the episode progressed, I thought the banter between the two of them felt oddly inconsistent. One moment, it seems they both don’t really want anything to do with the other. And the next moment, Barbara suddenly thinks there’s a spark between them just because it seems he understands exactly the type of person she is within. But Barbara, all he did was make vague generalizations about your life the way a fortune teller or psychic medium does; he’s got “ulterior motive” spelt all over his Andrew Scott-Moriarty haircut! Gordon meanwhile still thinks Lee’s the obvious target and goes to warn her of the nature of his investigation, as well as asking that she leave Gotham for the time being. I thought it was kind of a rude move for Gordon to lay this on Lee now, and knowing good and well she’s going to encourage him to pursue the case anyway. And I’m not sure what Lee is trying to prove with her assertion that she’s not going anywhere, instead willing to take her chance within Gotham’s confines. There’s a point where daring and audacious become senseless and careless, Lee. I wouldn’t even blame her if she exploited this “Get out of Gotham Free” card; I’m a criminal justice minor myself, but you wouldn’t have to ask me twice if you told me I was the sole target of a psychotic killer, and that I needed to hop on the next passing Metra train out of Chicago. In an extensive cat-and-mouse game, Gordon and Bullock’s investigation of The Ogre leads them to the killer’s father, who as it turns out, helped cover up his son’s first murder, yet remains oblivious to his subsequent crimes. Initially, the father doesn’t believe Gordon’s claims that The Ogre is responsible for the murders of many young women throughout Gotham because he remembers his son’s face as being abhorred, but, in quite the unique twist, that’s only because The Ogre – whose real name is Jason Skolimski – has had a hefty plastic surgery operation performed on his face. And for as much flack as I’ve given Gordon in the past, I am eager to see him settle the score with Skolimski. Just hearing Gordon’s speech over the television declaring his promise to hunt Skolimski down and end his reign got me a little bit more pumped to see how this arc continues next episode. Is it time to talk about the Bruce and Selina subplot next? Not many people would call me a bleeding sentimentalist, yet here I am positively gushing over these two kids and their hoodlum antics. I was a little apprehensive that Bruce and Selina would regress back into giving each other the silent-treatment again after Selina shoved a guy out of a five-story window last week. And yet to my surprise, there isn’t any quarrel at all to be found here. Instead, Bruce invites Selina to be his ‘date’ at a gala so that they can pickpocket Sid Bunderslaw (Michael Potts), an operative of Wayne Enterprises that hired Reggie to investigate Bruce and Alfred, and see what's in Bunderslaw's safe. Banter between Gordon and Lee in the past that was trying to be cute came across as awkward for me, but with Bruce and Selina, it’s the other way around. They’re two kids crushing on the other but not really sure how to articulate that into conversation, and I think that gives a genuine aura to their softer scenes. If I hadn’t dived into how vividly Gotham is setting up the dichotomy between Bruce and Selina in my review last week, I could have just waited to review this episode and pasted their entire exchange in the gala over whether it’s justified to kill someone, because the dialogue sums it up impeccably. Moving down the list of subplots, Maroni pays Oswald and Gertrude a visit at Oswald’s nightclub in what I can only guess is a move meant to sew some discord between Oswald and his mother by revealing some most abominable crimes Oswald has committed across the season. Ordinarily, this might be a move that could cause some big damage to Oswald and Mama Cobblepot’s relationship, but Oswald is able to sweep Maroni’s comments under the rug with a white lie, and so all is well between mother and son. But then this resolution began to make me question what purpose these scenes had in the first place, if it wasn’t going to amount to anything bigger in the future. Perhaps Gotham felt that it needed to show that even Oswald isn’t fond at all of the fact that he must lie even to the people he loves most. But I also feel this subplot should have been moved up a few episodes earlier in order to have Maroni’s manipulation of Gertrude be the catalyst that sends Oswald on his campaign to personally execute Maroni, the goal we’ve already been seeing Oswald working towards for the last two episodes. Yes, in general I regard the mob elements of Gotham as the jewel in its crown, but the show really wants to stretch this antagonism between Oswald and Maroni across the second half of the season so thin that if it were a slinky, you’d never see its original form again. Finally, we have Edward ‘Riddle-Man’ Nygma’s arc to cover and boy, have I missed this geeky CSI and his holier-than-thou attitude towards the other GCPD jocks. (No really, I have!) Nygma discovers this week that Ms. Kringle’s boyfriend – Officer Dougherty (Zachary Spicer) – is physically abusing Kringle, and tries his best (in the form of riddles no less) to get Dougherty to back off. When Dougherty later resorts to physically beating up on Nygma too, Nygma retaliates in self-defense by stabbing Dougherty – many times, mind you. I still think it will be a little while before we see how this murder will affect Nygma in the big picture of him becoming The Riddler, but for now, I’m a little intrigued to see if this act of violence brings to the surface any other dark impulses lying in Nygma; it’s quite clear at the episode’s end that he’s got a little enjoyment for the forbidden fruit of murdering. Okay, maybe a lot intrigued. Anything to get the aftertaste of Batman Forever's Riddler out of my mouth. • Lee accidentally whacking Gordon in the face with her phone wasn’t something I knew I needed until now.